Our content management system is based on the award-winning and open-source Drupal platform, used also by renowned organizations such as Harvard and NASA. It features state-of-the-art technology, flexibility, security and reliability made possible by many years of dedicated development at the hands of 700+ developers working on the core, and countless other thousands of developers (including us) working on the over 2000+ extended modules. 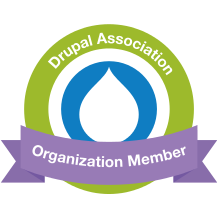 What Drupal brings to the table is a top-of-the-line development platform with a $0 price tag. It gives us the flexibility and power to produce advanced sites of the highest quality while passing on the initial savings straight to our clients. On the content-end, as with any good content management system, editors with the proper permission will be able to add and update all the site's content using an intuitive WYSIWYG interface. The system allows for multiple levels of access and authority that can be assigned to any and all site members. Because our company runs a free introductory marketing campaign with all new sites, we also guarantee a stronger online presence that translates into a permanent boost in traffic. Although we can install our sites on any server of your choosing, the majority of our clients prefer to be hosted with us. We specialize in providing a hassle-free effective solution, so we deal with the specifics concerning software, installation, security, bandwidth, storage space, etc, so that you don't have to. With Avenue Web Media you get a fast, efficient and reliable hosting service that simply works. And, although you probably will never need to, if anything should seem out of place, you can call our familiar customer service to get immediate answers instead of having to deal with some random tech company. Finally, to top it off, our hosting prices are extremely affordable and this service is free for the first year with any new site. To get more information regarding the technology behind our servers read more About Our Web Hosting.